Pyongyang: More than a thousand years ago, a huge volcano straddling the border between North Korea and China was the site of one of the biggest eruptions in human history, blanketing eastern Asia in its ash. 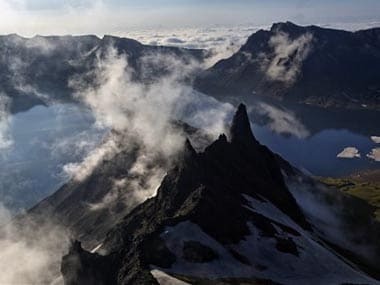 But unlike other major volcanos around the world, the remote and politically sensitive Mount Paektu remains almost a complete mystery to foreign scientists who have — until recently — been unable to conduct on-site studies. Fresh off their third visit to the volcano, two British scientists studying the mountain in an unprecedented joint project with North Korea say they may soon be able to reveal some secrets of the volcano, including its likelihood of erupting again. They're collecting seismic data and studying rocks ejected in Paektu's "millennium eruption" sometime in the 10th century. "It's one of the biggest eruptions in the last few thousands of years and we don't have yet a historical date for it," Clive Oppenheimer, a professor of volcanology at Cambridge University, told The Associated Press after returning to Pyongyang last week from an eight-day trip to the volcano. "The rocks are a bit like the black box of a flight recording. There's so much that we can read from the field site itself." Paektu is considered sacred ground in both China and in North Korea, where it is seen as a symbol of the ruling Kim family and of the revolution that led to the founding of the country, officially known as the Democratic People's Republic of Korea. On the North Korean side, the area around the mountain is dotted with "revolutionary historical sites" and secret camps from which Kim Il Sung, North Korea's first president, is said to have led guerrilla attacks against the Japanese, who held the Korean Peninsula as a colony until their 1945 surrender ended World War II. Fears that the 2,800-meter-tall (9,200-foot-tall) volcano might be unstable began to grow in 2002, when increased seismic activity and ground swelling suggested the magma below the volcano was shifting. That activity subsided in 2006. Though not seen as a serious possibility by most experts, concerns were raised in South Korea and Japan that nuclear tests in the North — conducted at a site which is less than 100 kilometers away — might trigger an eruption. 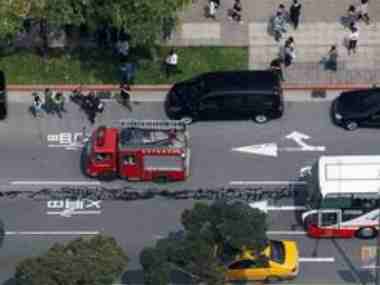 "That activity sparked a lot of interest both in China and the DPRK, but also in Japan and South Korea and internationally," said Oppenheimer's colleague James Hammond, a seismologist at Imperial College in London. He added that fears of another major eruption soon are probably unfounded. "It's certainly very tranquil at the moment." Even so, Hammond said the activity prompted the North Korean government to reach out to the international scientific community for help in understanding Paektu's inner workings. Until the 2002 activity, little scientific research on the volcano had been conducted in China or North Korea. The project got underway in 2011 at the request of a North Korean government agency, the Pyongyang International Information Center on New Technology and Economy. With funding from the Richard Lounsbery Foundation, a philanthropic organisation based in Washington, DC, that supports the sciences, Oppenheimer and Hammond became the first Westerners to visit the North's six field stations on the volcano. Hammond said that although he was intrigued by the opportunity, the project was a logistical challenge, and not just because of language differences and North Korea's unfamiliarity in dealing with foreign researchers. International sanctions on the North over its nuclear weapons program made it difficult for the scientists to bring in some of the equipment they wanted because of concerns they could have dual use applications that might benefit the North's military. "If we want to understand what the volcano is like today, we need to park instruments on the ground," Hammond said. "Building the models of what happened previously allows us to address what might happen in the future." 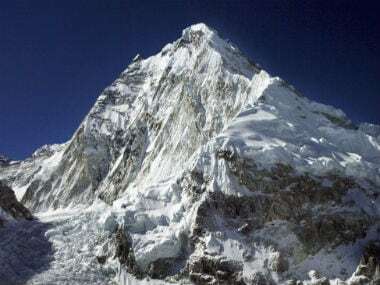 In September last year, Hammond installed six broadband seismometers to record activity on the volcano, while North Korea's Korean Earthquake Bureau built protective huts for the equipment. He also collected samples of pumice that could provide insight into the scale of the millennium eruption, which is believed to have occurred between 930 and 940 AD. Hammond said their next trip is scheduled for next year and he hopes the project will continue beyond that. He also hopes to host North Korean researchers for training and joint research in the UK.